We woke up early, though not without hitting the snooze button several times. After our morning ablutions, we walked to the carinderia (small eatery) where we had lunch the previous day for breakfast. Seems like tapsilog (tapa or cured beef, singangag (fried rice) and itlog (sunny side up eggs) was the group’s favorite, save for Gail, who ordered a plate of spaghetti and a hamburger. In the end, it was she who was most happy with her order; our tapa was a big disappointment. Completely rejouvenated and energized, we set off to the market to buy additional things we needed for the day. At the bakery, we were able to buy pan de sal, pan de coco and Spanish bread for snacks and for feeding the fish. At Php 2.00 each, we were pleasantly surprised to see that the bread are double the size of the ones we get in the neighborhood bakeries in Manila. Also, unlike their Manila counterparts, you can actually taste the bread and the fillings. Stocking up on water to keep us hydrated, we made our way back to Krystal Lodge where our boat will pick us up (ah, the advantages of living by water). 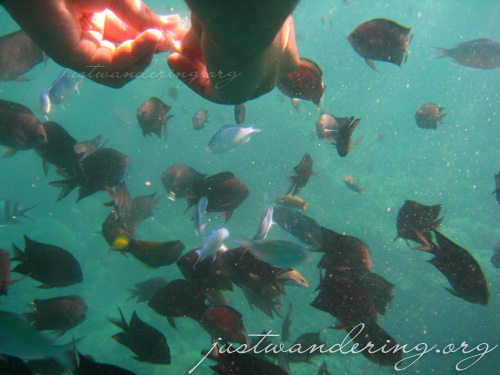 Armed with our snorkeling gears, underwater cameras and picnic stuff, we boarded our boat for the day. We set off for Coron Island, the Skeleton Wreck our first stop. We had the option to anchor in the middle of the sea or dock in the nearby Mawowoy beach. We opted to dock, since Gail wasn’t too hot about the idea of seeing sunken ships. I was curious and hesitant at the same time. From the shore, the wreck is within swimming distance. The wreck hasn’t sunk in too deep water, so you can see it even if you’re just snorkelling. I swam about 10 meters from the shore and quickly turned back — for some reason, I don’t think I can do it. Gail and I stayed beside the boat in the water and while we were chatting, a mother and her child came paddling through the water. They turned out to be the native Tagbanua caretaker of this particular piece of land. The Tagbanua tribe have ancestral claim on the waters surrounding Coron, and the admission fees charged for the various tourist attractions in the island are for the maintenance of each. Eric, Marc and Ferdz swam back to shore elated — they saw the remains of the boat; the skeleton. We puttered out of the cove and into another one: Banol. We passed Banol Beach on the way to Mawowoy. We were all taken in by the peaceful aura it seem to give off. Fine white sand, crystal clear blue waters, lush vegetation, wooden huts and dramatic limestone formations, Banol is the paradise you’ve always seen in pictures, but never thought is actually real. Despite the troubling sight of jellyfishes bobbing in the water as we dock, we excitedly got off the boat and went our own way taking photos. We had brought the fish we bought at the market yesterday to be grilled for lunch. The great thing about hiring boats in Coron is that you can ask the boatmen to grill your lunch for you. Our bankeros set off cleaning and grilling our fish, since there would be no other place to cook afterwards. It was still fairly early, so we decided to have an early lunch at Banol. We feasted on more shrimp and beautifully grilled fish, with a side of fresh tomatoes, and toyomansi (soy sauce and calamansi) dipping sauce, and the local suka (vinegar) that had a hint of sweetness. Eric’s all too willing to do crazy poses for us. That’s why most of the photos in our camera are of him. After lunch, Eric and I played around with my underwater camera. Rather, I took pictures and ordered my all to willing subject. But hey, the photos turned out pretty good, right? Right after some rather embarassing poses, we saw a boat approach. We moved on to the other side of the cove, and tried to drown out the noisy squeals of the new arrivals. As much as we loved to stay longer (Banol is the kind of place you wouldn’t want to leave and when you finally do, you find yourself wanting to go back), we agreed that our paradise has been contaminated; it’s time to move on. Roge, our boatman, took us to Barracuda Lake next. There was a wooden dock waiting for us, and a set of wooden steps. Uh-oh. I thought. The climbing part is here. It turned out that the stairs is the easy part. Soon enough, the stairs ran out and we had to climb over limestone formations. I was pretty scared clambering up the jagged limestone. My feet was wet, which meant wet slippers. Though the traction of my rubber thongs on the limestone wasn’t all too bad, my wet feet on the rubber made me feel I’m going to slip at each step I take. There was even this portion where there was a pretty huge gap in the limestones, and one part had this rather narrow peak that you’d have to cross. What awaited us on the other side though was spectacular. Barracudda lake, like most lakes in Coron island, is a mix of fresh and salt water. The deep blue green water is a sight to behold. Unfortunately, once you get at the end of the “trail” there’s hardly any place to put your things or sit. Add to that the sudden drop that you can clearly see from the shallower areas. The lake got its name from the Barracuda that used to live there. The barracuda was long gone, but some of its offsprings are still there. The guides (who jump from limestone to limestone, much to our amazement as we cling on the wooden banisters for dear life) warns us not to go to the center of the lake, where it’s said to be at its deepest, and where the barracudas roam. With that warning, I was content to sit at one of the more comfortable nooks among the limestones and dry my feet and slippers. The scary climb through limestone previously was now a source of excitement. After all, I was already able to climb it once, surely, I can do it again. We set of next to Kayangan Lake. Kayangan was dubbed one of the cleanest lake in the Philippines. 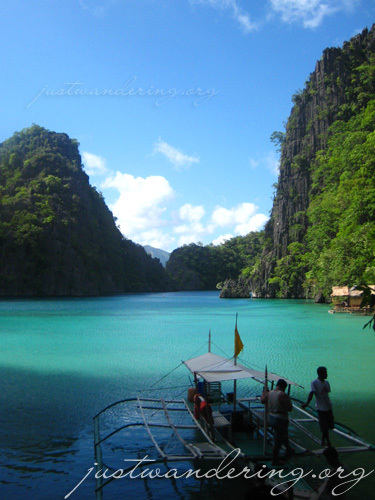 It’s also one of the must see places in Coron. 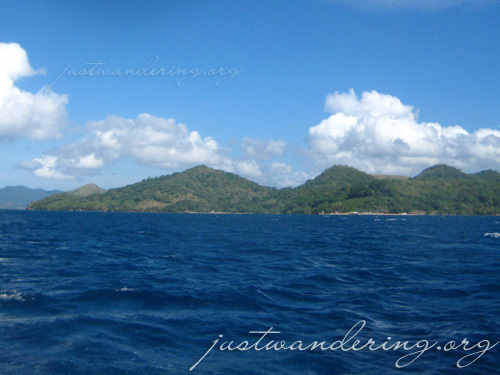 When we got to Kayangan’s entrance, I knew right then that it really is the most visited places in Coron. The dock was clearly organized and there are space enough for several boats to be docked at once. 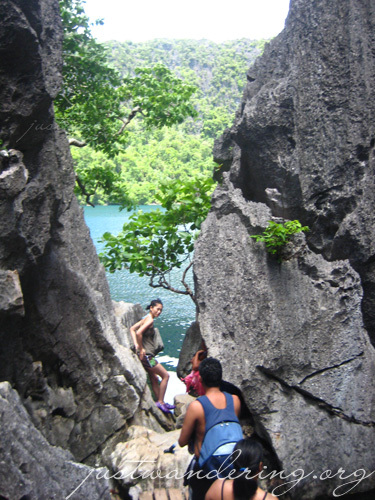 Like Barracuda Lake, Kayangan Lake can be reached by going up and down the mountain. Unlike Barracuda Lake though, this is relatively an easier climb. The steps were carved or are huge slabs of stone. There are wooden banisters on each side, and enough space for two people to pass through at once. Once you reach the top, you are greeted by the sight of the stairs you’d have to take to go down to the lake. Most groups stop at the summit to take photos of the magnificent view of the cove below. There’s a huge boulder you can climb to get a better vantage point, or pose on for your Friendster, MySpace, Multiply or Facebook profile photo. Going down is definitely easier. However, the steps are uneven and can be slippery so exercise caution when going down. Kayangan Lake is even more dramatic than Barracuda lake when you see it. What’s really impressive about it is that you can actually see all the way down the bottom of the lake, even if you’re not in the water. The visibility in the lake is simply astounding. No wonder GMA chose this place to shoot Dyesebel (much to the ire of travelers who went there during their shooting date; I hear the entire lake was closed off). Like Banol, Kayangan is the kind of place you wouldn’t want to leave. Apart from a couple of local kids playing in the water, we had the lake all to ourselves. There were fishes swimming around, though lacking in variety. They swam near the platform, which made us think that they have gotten used to having people feed them. Unfortunately, we didn’t bring the fish bread with us. Luckily, they never used their pointy things on us. The hike back up was torture, considering we were leaving such a beautiful serene place behind. But once we have crested the peak and started going downhill, it was easier and we found ourselve looking forward to our next destination. The next stop was supposed to be the Twin Lagoon. However, since the tide was still high, we wouldn’t be able to enter through it passage. We went instead to Siete Pecados. The Siete Pecados was named after the seven islets that surround this abundant coral reef. The reef is pulsing with life, as evident by the schools of fishes and corals that occupy the area. To prevent damaging the reef, boats are not allowed to drop anchor nor use the long bamboo poles they use to dock. Instead, they use oars to paddle and manouver, and boats are tied to bouys. The current was pretty strong, and unless we move away from the boat, we kept on bumping on the hull or the bamboo that helps keep it balanced. I pretty much gave up on snorkelling after a couple of minutes, feeling panic rising everytime I put my head down the water (which is pretty weird, I think. I’ve already swam with a huge whale shark, sans life vest even, and here I am freaking out everytime I see the water level go past 10 feet). Finally, everybody had their fill (including the fishues). It was still fairly early, but we were running out of energy. Since we were near the Maquinit Hot Spring, we opted to go there instead. Of course, the day and the adventure doesn’t end there. 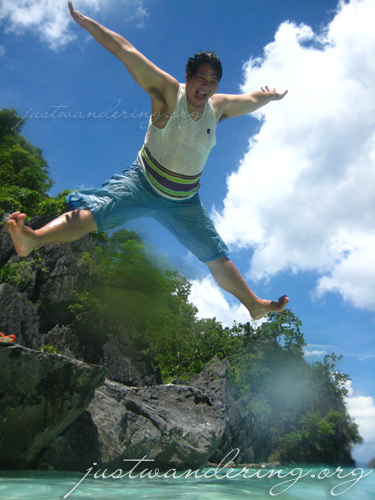 Wow great pictures and Coron is really a good place! Aditya: But it’s Kosta! KOSTA! The purple huggy bear! Micamyx: It really is a beautiful place! Sayang nga we weren’t able to explore as much. But that should be reason enough to go back no? I loved Coron! I so loved it that I never want to go back to Boracay, ever!! I love the serene quietness of the place!! I wish I can go back soon!! Siete Pecados is Spanish for Seven Sins. FYI: there are two Siete pecados in the philippines. one in Palawan one in Guimaras. Nina: ur photos are impressive… astig.. parang gusto kong magbook ng ticket sa SEAIR btw: kelan ka pwede for Galera? tell me your open dates..
Didi: Exactly! Okay na sakin na walang night life at fastfood. Mas happy sa Coron! Eric: Ay ganun? Ahahaha. Kaya pala yung story na nabasa ko was about these seven daughters who went out to sea despite their mother’s warning. Kelan tayo babalik ng Coron? Hi, Nina. Great photos! Did you and your group arrange for the Coron island tour yourselves or was the tour arranged through the resort you stayed in? Saan pala kayo nag-stay sa Coron? Do you mind publishing the rates for both tours and accomodation? My husband and I will be in Coron from July 5-8 but we haven’t found a decent accomodation. We’re also very interested in the Coron island tour package but all the ones we’ve seen have a min of 4 pax. We’re okay with joining a group so that also works. Nina, I got your email. Thanks so much for taking the time to answer all of my questions (and then some). 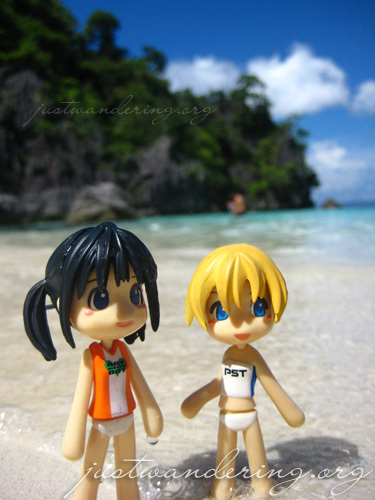 Your blogs got me and my husband, Mike so excited to get to Coron. You are truly an itinerant. Have many more journeys. Sari, it’s even more gorgeous in person. I want to go back! hi! do you have the number of your boatman??? Sounds like he gave you guys a real good time in the island! we’re going there by march and i’m bringing 8 foreigners with me to explore! THANK YOU BIG TIME FOR THE BLOG! Please send me the number of your boatman so we can do business with him too. Take it easy and more power. aha, nagtaas pala sila ng entrance fee ngayon..
Chyng: Exag ang prices sa Coron! Sa El Nido, one time payment lang na Php 200 for up to 10 days pa!